Most of the Gulf coast and deep South woke up this morning to sub-zero temperatures which cancelled flights, disrupted traffic and closed schools and businesses. Crippling winds and record-breaking low temperatures were recorded in New Orleans and other cities in the US deep south. 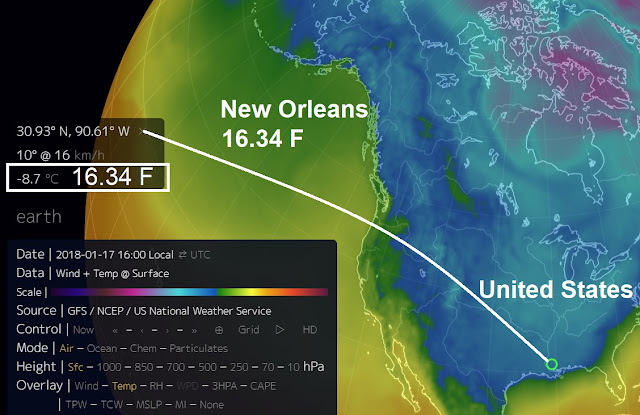 The blast of cold air shattered records early Wednesday in Louisiana and Mississippi. In Houston, the nation’s fourth most populous city, most freeways were closed on Wednesday morning after icing over, the city’s Office of Emergency Management said. According to Reuters New Orleans had record-breaking cold temperatures Wednesday morning with 16.34 degrees Fahrenheit in the area, smashing its previous record 23 degrees set in 1977, according to the NWS. It's thhe second time allready in 2018 freeze warnings for deep south and the Gulf Coast have been recorded. Hattiesburg, Mississippi, also broke temperature records with 12 degrees Fahrenheit on Wednesday, beating its 14 degrees also set in 1977. The US has had a tough start in 2018, we are just into the third week and already parts of the US has been considered colder than Mars and the North Pole. Remarkable stat's are being banded around the net as some weather forecasters predict the cold will last well into January. The Atlantic White Shark Conservancy said it had found five dead thresher sharks frozen to death on the shore of the Cape Cod Bay in Brewster, south of Boston. Glass windows were said to be cracking on Chicago's new Apple building from the extreme cold temperatures. Low temperatures in the minus 40 deg F (-40 deg C) have been recorded in northern Minnesota this month. According to the Weather Channel, New Year's weekend in the Plains, Midwest, South and East, shattered many daily records into the first days of 2018. Many cities had their coldest new years eve ever while many cancelled celebrations. A temperature of -35C was recorded in Mount Washington Observatory in New Hampshire — the highest peak in the northeastern United States — breaking a record set back in 1933. With temperatures colder than domestic freezers, data from the Curiosity Rover, which is roaming the red planet, showed temperatures on Mars reached a comparatively balmy -23C on December 20, and with temperatures around -21 deg C or lower the North Pole has been actually warmer than parts of the US.